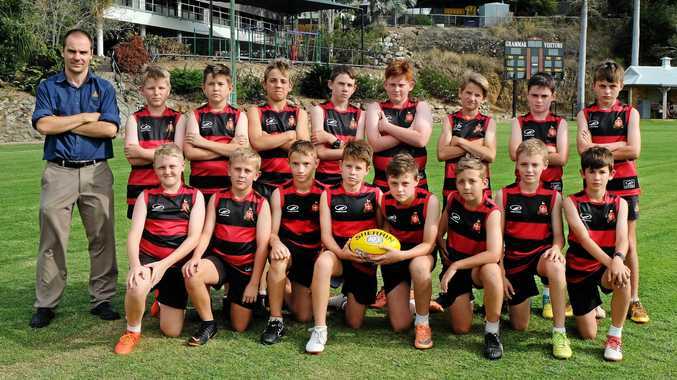 AUSSIE RULES: The Rockhampton Grammar School primary team is ready to test another level of football when they make their AFL Schools Cup state finals debut on the Sunshine Coast this week. RGS will play in the primary male division, facing Gaven State School in their opening game on Friday. The Cathedral College will compete in the senior female division. Queensland's premier state-wide interschool competition, the Tribal Sport AFLQSCup provides pathways for boys and girls from Years 4 to 12. This weekend's finals, to be played on Friday and Sunday at the Maroochydore Multisports Complex, are the culmination of 11,509 students competing across 578 teams, from 249 schools from Queensland and NSW Northern Rivers. RGS advanced to the state finals after winning Rockhampton District Friday Sport, Capricornia and North Queensland qualifying rounds. In the mix of Year 5 and 6 players, the sport of AFL is new for most of the players. RGS coach Lachlan Libke said the start of the year was a big learning curve for the boys. "Luckily, this playing group have talents that spread across the football codes so my biggest advice to the players has been to play to your strengths, have a job and stick to it. The rest will take care of itself,” Libke said. Year 5 student Ethan McAlister is one of the AFL rookies in the line-up. "All I knew (about AFL) was that the Western Bulldogs were my favourite team because my league team is also the Bulldogs,” Ethan said. Fellow Year 5 student Ryan Skuthorp plays for Brothers in the local AFL competition. "It's been good teaching them the skills to get better,” Ryan said. "We've had a lot of practice this year so everyone has improved. Libke said in the junior level the game was split into three areas - technical ball skills, tactical skills and fitness. "The team has been training hard on their technical ball skills and have been making improvements over the year,” Libke said. "Their accuracy with passing and kicking has also continued to develop. "Tactically, it will be interesting to see how the team goes against this higher level of competition, especially when the fatigue of the big games sets in.